Is live-action better than animation when it comes to writing TV specs? Would an animated show like Archer or American Dad be a good choice as a spec script for [the TV writing fellowships]? I worry that a live-action show would be a more appropriate idea and I don’t want to immediately shoot myself in the foot with a bad show choice. I typically prefer watching and writing comedy, but if sticking a group of zombie snacks in a prison and calling it Walking Dead gets my spec to the top of the pile, that works too. First off, you need to pick your lane. By that I mean: if you want to write comedy, by all means focus on comedy. But you shouldn’t write a one-hour spec “just because” it may be more well-received (or not). A Walking Dead spec will only work for a drama writer. Considering that you seem to prefer writing comedy, your next point of order should be to pick a good comedy to spec. Which brings us to your great question: should you spec an animated show, or a live-action comedy? And does it really make any difference? The short answer is: no, it doesn’t really make a difference. Up to a point. Now onto the longer answer. If you want to apply to the Nickelodeon fellowship, although they do accept animated specs, they can occasionally frown upon them. Or, at the very least, frown upon animated Nickelodeon specs. It’s their bread-and-butter, and they’d rather you show your comedic writing chops through the live-action model. In regards to the other fellowships, the door is wide open. With that said, the reality is that there are fewer legitimate animated options to spec. This year for instance, you could write an Archer, a Simpsons/American Dad, a Bob’s Burgers, a Bojack Horseman, a Rick & Morty, and—that’s about it. Four of those six are pretty much over-specced and old, and the other two are somewhat of a gamble. Bojack will undoubtedly become popular this time next year, but it still is a risk right now. Warner Bros. for example is not accepting it. So, what does my convoluted answer really mean? Half-hour animated specs are just as valid as live-action ones. In a vacuum. Given their rarity and varying popularity, finding a good animated show to spec is already a difficult task, much less crafting a great one. FX’s Archer was a very popular comedy spec for a lot of people in its hey-days, but you could argue the show was already this close to being live-action. Yes, a great animated TV spec will always be a strong choice for any TV writing fellowships. The format is rarely what detracts readers from pushing your script to the top. It’s more likely that the animated show in question isn’t that well-regarded to begin with. 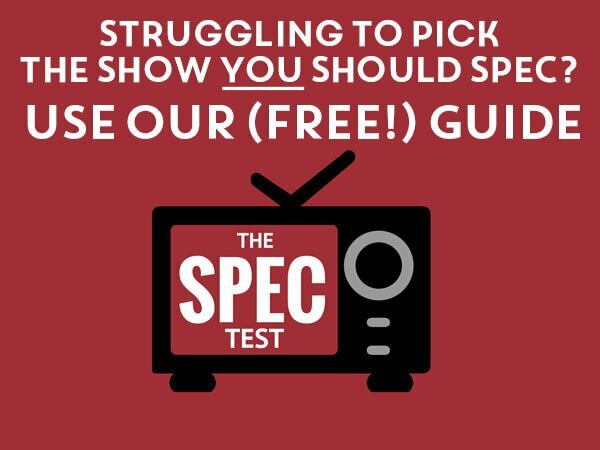 As usual, the answer to most spec choice questions should be boiled down to: pick the show you will write the best spec for. You should not discard a great spec idea just because a show is too much or not enough popular. If you have the bestest Archer spec ever, by all means write it and send it out. Just be aware it’s pretty much most people’s only choice (with Bob’s Burgers) when it comes to recent animated shows. Several animation writers in the studio all gave us the same advice – don’t write for animation! They told us to go work in live action. The pay is better because it’s WGA and there are residuals. Gotta love straightforward salary advice. So what do you think dear reader? If you have a question, feel free to send me a message.